Frank Lampard takes Derby to QPR this weekend. 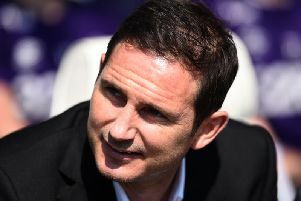 Frank Lampard will once again go head-to-head with one of his former managers on Saturday as he takes his Derby County side to Queens Park Rangers. The Rams boss played under Steve McClaren during the latter's ill-fated spell as England manager which ended with an infamous 3-2 defeat to Croatia at Wembley that saw England fail to qualify for Euro 2008. Lampard scored a penalty in that game while current Derby goalkeeper Scott Carson also featured in the England line-up. And having overseen a win over one former boss in Jose Mourinho last week, Lampard expects a tough game against another man he has great respect for. He said: "He tries to play good football and his spell here showed that he tries to play that attractive brand, but at the same time we all have to be pragmatic and sometimes it’s just about hard work in terms of getting results and like us, they’ve had some difficult spells this season. “But he’s a very savvy manager and I expect a very competitive game in what will also be a tough atmosphere at their ground – I don’t think I’ll be too endeared given my Chelsea days!" And with a 1-0 defeat at Bolton still on Rams minds from their previous game last Saturday, Lampard is keen to get back to winning ways. He said: "We go there with Bolton fresh in our memories but it’ll be a different game, although you know if you don’t bring your game in this league you’ll get beaten. Lampard added that Curtis Davies is back in contention following a spell on the sidelines. George Evans is training again but not yet fit, while Joe Ledley will miss out with a recurring back problem which has also seen him omitted from the Wales squad chosen by Ryan Giggs this week.